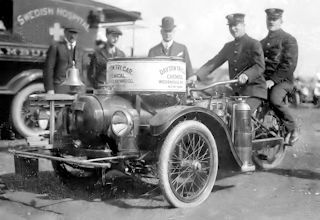 Manufactured by the Davis Sewing Machine Company in Dayton, USA in 1915, the Dayton Tri-Car Chemical was a specialised vehicle that carried a 35-gallon tank, 206 feet of hose pipe and two 7 gallon hand extinguishers. Along with tools like a ladder, pick-head Axe ad regulation lanterns the Dayton Tri-car was fitted with a "locomotive bell". Used as a fire fighting machine it was powered by a twin-cylinder engine that had two speeds and was able to reach 45mph. It also featured a Splitdorf magneto-generator unit that provide a current for both lighting and ignition.